The Bottlehead DAC can handle 16,24 and 32 bit audio data at sample rates of 44.1, 48, 88.2, 96, 176.4, 192kHz, and (via USB) 352.8 and 384kHz. Sample rates through 192kHz can be handled by the USB (asynchronous UA2), coax digital and TOSLINK optical inputs (assuming your TOSLINK source is capable of transmitting 192 kHz). No switches need to be thrown to select different sample rates, the sample rate is automatically sensed by the DAC and displayed on a classic 7 segment red LED display inside the 4.5” x 3” x 7.25” (approx.) cabinet. The images shown are of our prototype. We have a little more attractive design in process and we will update the images to show the production model when we have it complete. The DAC chip used is the Texas Instruments Burr Brown PCM5142 Delta Sigma DAC with 112dB S/N, exceptionally low out of band noise (for reduced EMI and aliasing), integrated negative charge pump line driver (which means no output coupling capacitors, ICs or tubes, and a low output impedance) and intelligent muting (no pops). “For those few that haven’t heard my thoughts on digital filters, a quick synopsis: As far as I know all digital filters inside DAC chips use special DSP “tricks” to get really good spec sheet numbers at low cost, BUT these tricks wreak havoc with the “musicality” of the sound. This is why people like NOS DACs. BUT with a NOS you still have the aliases which cause a “dirty” sound. So what I am doing is relaxing the requirements of the filter, so it doesn’t have to meet those insane numbers in the DAC spec sheets, the result is I can implement a simple filter that fits in an inexpensive FPGA. The result is something most people have never heard, the musicality of NOS without the “dirty” sound of the aliases. It’s simply stunning. Listening to your favorite music with this filter is a whole new experience. There HAS to be a filter, if you just send a 44.1 or 96 or whatever, the DAC chip will use its own. The only way to turn it off is to upsample to 352 or 384. BTW a reconstruction filter is not evil; it is a very good thing. It’s just that all the DAC chip implementations have made compromises that adversely affect the sound quality. That is what my filter is all about, doing it right so you get the good things from a proper reconstruction filter without the bad side effects of the DAC chip implementations. As to buzz words, my own reconstruction filter is an FIR with about 1200 taps. At 44.1 (or 48) input it is an 8X upsampling filter. The FIR is implemented with a single 52 bit MAC running a loop going through the coefficients and intermediate results. This loop runs at 96MHz no matter what the sample rate. The filter is intermediate phase. A linear phase filter has equal amounts of pre and post ringing but fairly short amount of time in each. The minimum phase has no pre ringing, but in order to get the same over all similar functionality it has to have a much longer amount of post ringing. The intermediate phase splits the difference and has a small amount of pre ringing and post ringing that is a little bit longer than linear phase but much less than minimum phase. This is also deliberately a short filter. That means the amount of time it spends ringing is a very short amount of time compared to other filters. The tradeoff is that the ultimate amount of alias reduction is only about 80db, whereas those in modern DAC chips are going to 130 db or more. This is the tradeoff I mentioned, by not aiming for nearly as much ultimate image rejection I get a filter that sounds much better. There is no dither involved; it simply is not needed in the DAC. In order to fully realize the benefits of this filter the DAC needs to be constructed in such a manner that the benefits are not masked by power supply noise, jitter, or unnecessary buffer or gain stages. And so these areas have received special care as well. And we have future plans to offer a battery supply in kit form that improves the black background even further. What matters is the jitter at the DAC chip (in the DAC). Having a fixed frequency clock in the DAC, right next to the DAC chip is the best way to implement this. You can do this when the DAC is master; it has the “master clock”. USB can do this in “asynchronous mode”. The BH DAC uses asynchronous mode so it can do the DAC as master. In this mode the source (usually a computer) sends the data out, but the DAC can tell it to speed up or slow down so the average data rate matches the clock in the DAC. There is another USB mode called adaptive, in which DAC is the slave, but the BH DAC does not use this. SOME other DACs use this mode. 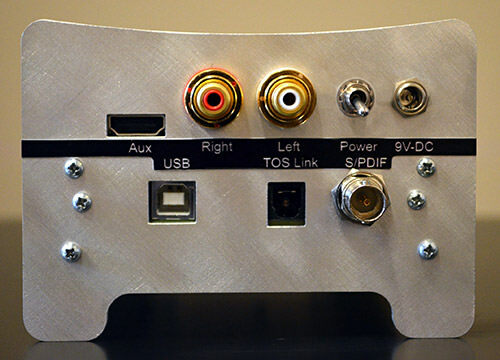 The S/PDIF inputs (coax and optical) just work with the source as master and the DAC as slave. Thus the DAC has to somehow synchronize its clock to the data rate from the source. This is traditionally done with a device called a PLL, which is built in to all the S/PDIF receiver chips. PLLs have much higher jitter than a good fixed frequency clock. The BH DAC does not do it this way. It cleans up the S/PDIF signal, and sends it into an FPGA (field programmable gate array) which does the S/PDIF decoding. But the special part is a digitally controlled ultra low jitter clock. This is almost as good as the best fixed frequency clocks. The FPGA tells this clock to speed up or slow down so it is synchronized to the average data rate of the source. The result of this is that both S/PDIF and USB produce ultra low jitter to the DAC chip. This combination of ultra low jitter from BOTH S/PDIF and USB doesn’t exist in any other DAC. On other DACs one or the other will be significantly worse than the other input. Interestingly when we started this project with John we just assumed that the DAC would have a tube output stage. We even built two early prototypes with tube outputs that used our best technology. But the introduction of the PCM5142 into the mix radically altered our perspective. The negative charge pump line driver in the chip (nope, we don’t really understand how it works either) sounded so good that anything we added after it just colored the sound. So there is NO active output stage, the output from the DAC drives a simple final analog RC filter, which is what mostly determines the output impedance of around 500 ohms. “The firmware for the FPGA is stored in a special flash memory that is soldered to the board. When new firmware is needed you simply ship your DAC to Bottlehead and we will install the upgrade for you for a modest fee. I’m designing the USB input to handle 8 channels, but the hardware and firmware to couple multiple DAC boxes together will not be available at first, it’s going to take some time to get that ready. So why is this not a kit? As you may gather from the description, this is not just a DAC chip slapped on a minor variant of a developer’s board made compete with the cheap kits on ebay. There are many complex connections between many chips, regulators and other components on a multilayer board, and firmware must be installed and tested after assembly. Thus the DAC PC board needs to be manufactured in a facility that specializes in that kind of production. That board costs many hundreds of dollars. We got high blood pressure just thinking about the first phone call from an unlucky customer who blew that expensive board due to a wiring error or a slip with the meter probes, and we decided that for everyone’s sanity it made the most sense for us to assemble these DACs in house. There will be at least one supporting kit in the future, a battery supply. We have already tested the idea and it creates an audible improvement in sonics over both the stock universal wall wart supplied with the DAC and a CLCLC linear supply we built. And then there is the Nixie tube display that we have been dreaming about. That just might make it as a kit too. OK so how so how do I get one? Our initial production run of 50 units has sold out and is now shipping. Check back here for news of future production runs. some others have reported its very close to analog. The closest I’ve been yet with a digital source. It sounds great, I will let it burn in and get the gains where they need to be before I give my revue.